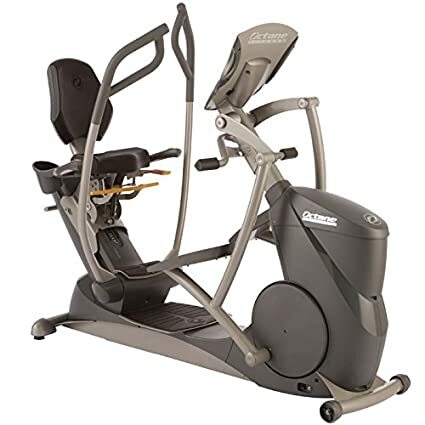 The Octane Fitness xR4ci Seated Elliptical Trainer is a high-end indoor elliptical featuring a heart monitor, adjustable seat, and built-in software that uses interval training and workout boosters to emphasize the upper and lower body for short periods of intense workout attention. As a convenience, this elliptical even features a cupholder for your water bottle. The xR4ci weighs just under 200 pounds and measures 57.5 inches long by 31 inches wide and and 29.5 inches high. The design is heavy but fairly compact. The pedals, chair, and support are black, and the console and screen are silver. This elliptical made it to our top picks for the Best Elliptical Machines of the year. . The best feature of the xR4ci is undoubtedly the software. The interval training is an excellent way to add some extra power to a workout. High intensity interval training is well-known to be a highly productive and useful form of exercise, so it is good to see that Octane Fitness is supporting its customers by allowing built-in software to use HIIT. The boosters are similar to the intervals. They isolate the upper or lower body, or provide a period of special coaching, in order to make sure that the arms and legs get enough specific attention. Other great features of the trainer include the comfortable, adjustable seat and the convenient heart monitor, which make it easy to keep a workout going and keep an eye on your hear rate to ensure that you are reaching your target. While this trainer is on the expensive side, it has enough features, software, and flexibility to make it a good buy. The bike is meant as an exercise tool for the whole body, and it does that very well. Using the machine for a half hour or so every day, while taking advantage of the boosters and intervals, will make a real difference in your physical fitness. The trainer manages to combine cardio training with building muscle in a natural and powerful way. It is a fusion that enables you to get more results with less time investment. The machine itself is fairly compact. While it is heavy enough that it will take more than one strong person to move it, the trainer’s size makes it easy to fit into a corner. It also isn’t as loud as some other trainers, so it won’t disturb other people if you use it. The interval mode will automatically add in short periods of higher resistance, which is perfect for building up muscle in a way similar to riding a bike up and down hills. The trainer is targeted at people who want to spend a serious amount of time and money at getting into top shape, and it delivers on its promise. The PowerStroke technology in the machine means that its users get 343% more glute activation and work than users of traditional recumbent bikes. The high price tag of the machine is the biggest potential dealbreaker. Because it costs over three thousand dollars, it would be nice to see Octane put a few sweeteners into the trainer, like an audio port for a music player, a fan, or a more elaborate display. However, the trainer’s robustness and durability are good, which is another justification of the price. Cheaper machines tend to break faster and often do not work out of the box, which can require annoying delays while you wait for replacement parts. The xR4ci seated elliptical trainer is an excellent option for someone who wants to make a serious commitment to in-home fitness. The price tag means that it is definitely not an entry-level machine. However, the machine is not exorbitant- it fits comfortably in the high-end exercise machine market. The xR4ci does a very good job at delivering a moderately comfortable full body workout. While it lacks some of the special features like a music player port or large touchscreen that, for example, high end exercise standing bikes have, it makes up for that in its superior ability to deliver a workout. After all, that is the underlying goal of such machines. The xR4ci compares well to its main competitors such as high-end recumbent bikes and typical elliptical trainers, because it can deliver a more targeted, ergonomic, and intense workout for similar money and a shorter time.